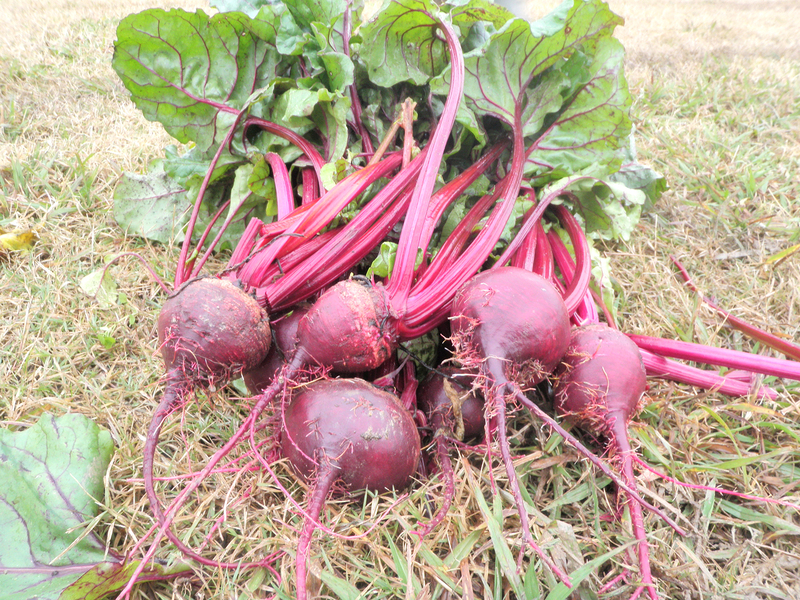 (Photo by Dan Gill) Beets and other root crops thrive and produce well in winter Louisiana vegetable gardens. Winter vegetable gardening is tremendously rewarding. Many of the vegetables we planted earlier in the fall are ready to harvest, and it is important to harvest vegetables at their right stage for best results. Here are a few guidelines for some of the most commonly grown crops. Root crops are harvested when the root is the proper size. Usually, the top of the root is readily visible at ground level, but it is easy enough to push aside the soil at the base of the leaves to check on the size of the root. Once harvested and cleaned, root crops can be stored for weeks in the vegetable bin of your refrigerator and used as needed. Harvest radishes and carrots when the root is about 1 inch across. Carrots can be left in the ground once they’re mature and harvested as needed, and the tops can be used as a parsley substitute. Harvest turnips when they’re 2-3 inches in diameter, and rutabagas – a close relative – when they’re 4-5 inches in diameter. Beets are best harvested at 2 inches and parsnips at 1 1/2 to 2 inches. Incidentally, to get good production, these plants must be spaced properly in the bed. When the seeds you plant come up, it’s very important to thin the seedlings to a spacing of about one and one-half to two times the width of the mature root. If this is not done, the roots generally will not develop properly. Broccoli heads are not harvested based on the size of the head but when the largest individual flower buds are about the size of a kitchen match head. Do not allow the broccoli heads to re­main on the plant so long that some of the buds open into a yellow flower. Remember that smaller side heads will develop and provide additional harvest after the main head is removed. Harvesting cauliflower also depends more on the appearance of the head rather than its size. The head should be relatively smooth when you harvest it, very much like the cauliflower you buy in the supermarket. If allowed to stay on the plant too long, the sections of the head will begin to separate and lose quality. If you did not blanch your cauliflower by covering the head with the plant’s leaves, it may have a purple, green or yellow tint to it. This does not greatly affect the quality of the head. Leafy crops such as mustard, spinach, Swiss chard, leaf lettuce, collards and turnip greens should be harvested frequently by breaking off the lowest, largest leaves. This is called cropping, and it provides harvest over an extended period. In the case of mustard and turnip greens, you may also harvest the entire plant when it reaches the desired size, but you will get only one large harvest from the planting. Harvest the entire head of semi-heading varieties of lettuce, such as bibb, buttercrunch and romaine, when the head is fully developed. Cabbage is ready to harvest when the head is solid and hard. Cabbage is one of the few crops that may be left in the garden after they’re ready to harvest, although the heads may split. If you are going to leave fully formed heads in the garden, rotate the entire plant one-half turn to prevent splitting. This slows water uptake by breaking some of the roots. Snow peas and edible-pod peas are productive, delicious and well worth growing. Harvest snow peas when the pods are full size but still quite flat. Edible-pod peas, such as Sugar Snap peas, should be harvested when the pods are full and round but before the peas inside the pod have fully developed. Bunching onions and green shallots can be harvested anytime during winter when the tops are large enough. Dig up the entire clump and remove about one-half of the bunch to eat, and then replant the rest to continue to grow for future harvest. The best weed control is accomplished by keeping beds mulched about 2 inches thick with leaves or other mulch materials. Promptly pull any weeds that show up. Aphids are small sucking insects that get on a wide variety of vegetables, such as lettuce and peas. Control them with insecticidal soap, permethrin or other insecticides labeled for use on vegetables. Caterpillars are a problem on greens and cole crops such as cabbage and broccoli. Control them with BT insecticides such as Dipel or Thuricide. Control snails and slugs with baits containing iron phosphate. Although winter vegetables are generally hardy, December plantings may need to be protected from hard freezes as will certain vegetables near or at harvest stage. If temperatures below 30 degrees are predicted, young seedlings should receive special attention by completely covering them with a 4-inch layer of loose mulch, sheets or tarps. The covers may remain over the plants for a few days, but remove them as soon as the freezing episode is over. You also may use plastic covering supported off of the plants or floating row coverings.